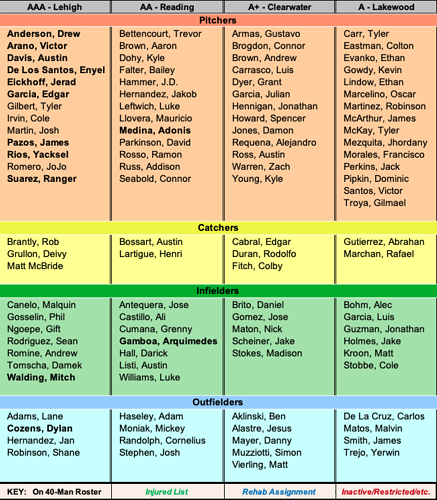 Transactions will be posted here as they are reported on MiLB.com's league transactions pages. RHP JD Hammer assigned to Reading Fightin Phils from Clearwater Threshers. RHP Trevor Bettencourt assigned to Reading Fightin Phils from Clearwater Threshers. LF Grenny Cumana assigned to Reading Fightin Phils from Clearwater Threshers. 3B Luke Williams assigned to Reading Fightin Phils from Clearwater Threshers. LHP Bailey Falter assigned to Reading Fightin Phils from Clearwater Threshers. LHP Jakob Hernandez assigned to Reading Fightin Phils from Clearwater Threshers. RHP Mauricio Llovera assigned to Reading Fightin Phils from Clearwater Threshers. LHP David Parkinson assigned to Reading Fightin Phils from Clearwater Threshers. RHP Ramon Rosso assigned to Reading Fightin Phils from Clearwater Threshers. RHP Addison Russ assigned to Reading Fightin Phils from Clearwater Threshers. C Henri Lartigue assigned to Reading Fightin Phils from Clearwater Threshers. CF Mickey Moniak assigned to Reading Fightin Phils from Clearwater Threshers. 3B Jose Antequera assigned to Reading Fightin Phils. LF Josh Stephen assigned to Reading Fightin Phils. 3B Ali Castillo assigned to Reading Fightin Phils. CF Simon Muzziotti assigned to Clearwater Threshers from Lakewood BlueClaws. C Rodolfo Duran assigned to Clearwater Threshers from Lakewood BlueClaws. LHP Damon Jones assigned to Clearwater Threshers from Lakewood BlueClaws. RHP Spencer Howard assigned to Clearwater Threshers from Lakewood BlueClaws. LHP Kyle Young assigned to Clearwater Threshers from Lakewood BlueClaws. LHP Zach Warren assigned to Clearwater Threshers from Lakewood BlueClaws. RHP Andrew Brown assigned to Clearwater Threshers from Lakewood BlueClaws. RHP Luis Carrasco assigned to Clearwater Threshers from Lakewood BlueClaws. RHP Connor Brogdon assigned to Clearwater Threshers from Lakewood BlueClaws. RHP Gustavo Armas assigned to Clearwater Threshers from Lakewood BlueClaws. SS Nick Maton assigned to Clearwater Threshers from Lakewood BlueClaws. 3B Jake Scheiner assigned to Clearwater Threshers from Lakewood BlueClaws. 1B Madison Stokes assigned to Clearwater Threshers from Lakewood BlueClaws. LF Matt Vierling assigned to Clearwater Threshers from Lakewood BlueClaws. C Colby Fitch assigned to Clearwater Threshers from Lakewood BlueClaws. CF Jesus Alastre assigned to Clearwater Threshers from Lakewood BlueClaws. RHP Julian Garcia assigned to Clearwater Threshers from Lakewood BlueClaws. RF Danny Mayer assigned to Clearwater Threshers from Williamsport Crosscutters. RF Ben Aklinski assigned to Clearwater Threshers from Williamsport Crosscutters. RHP Austin Ross assigned to Clearwater Threshers from Williamsport Crosscutters. GCL Phillies West released RHP Antonio Canizales. Philadelphia Phillies signed free agent RHP Saul Alcala to a minor league contract. Philadelphia Phillies sent CF Roman Quinn on a rehab assignment to Clearwater Threshers.Lehigh Valley IronPigs placed C Matt McBride on the 7-day injured list. Right calf strain. Lehigh Valley IronPigs placed RHP Yacksel Rios on the 7-day injured list. Abdominal strain. Lehigh Valley IronPigs placed 3B Gift Ngoepe on the 7-day injured list. Left shin contusion. Reading Fightin Phils placed RHP Connor Seabold on the 7-day injured list. LHP Garrett Cleavinger assigned to Reading Fightin Phils from Clearwater Threshers. 1B Kyle Martin assigned to Reading Fightin Phils from Clearwater Threshers. Clearwater Threshers placed RF Danny Mayer on the restricted list. LHP Nick Fanti assigned to Clearwater Threshers. RHP Tyler Hallead assigned to Clearwater Threshers from GCL Phillies East. RHP Julian Garcia assigned to Williamsport Crosscutters from Clearwater Threshers. RHP Ismael Cabrera assigned to Clearwater Threshers. Lehigh Valley IronPigs placed LHP Tyler Gilbert on the 7-day injured list. Left groin strain. RHP Tyler Viza assigned to Lehigh Valley IronPigs. Clearwater Threshers activated RF Danny Mayer from the restricted list. RHP James McArthur assigned to Lakewood BlueClaws. RHP Kevin Gowdy assigned to Lakewood BlueClaws. RHP Francisco Morales assigned to Williamsport Crosscutters from Lakewood BlueClaws. RHP Victor Santos assigned to Williamsport Crosscutters from Lakewood BlueClaws. Reading Fightin Phils placed 3B Jose Antequera on the 7-day injured list. Reading Fightin Phils placed RHP Trevor Bettencourt on the 7-day injured list. RHP Tom Eshelman assigned to Reading Fightin Phils. RHP Julian Garcia assigned to Clearwater Threshers from Williamsport Crosscutters. Philadelphia Phillies sent CF Roman Quinn on a rehab assignment to Lehigh Valley IronPigs. Philadelphia Phillies traded SS Jesus Azuaje to Colorado Rockies for Future Considerations. Philadelphia Phillies optioned RHP Edubray Ramos to Lehigh Valley IronPigs. Lehigh Valley IronPigs placed RHP Tyler Viza on the 7-day injured list. Right foot turf toe. Lehigh Valley IronPigs activated RHP Yacksel Rios from the 7-day injured list. RHP Spencer Howard assigned to Williamsport Crosscutters from Clearwater Threshers. Philadelphia Phillies recalled RHP Victor Arano from Lehigh Valley IronPigs. RHP Alexis Rivero assigned to Lehigh Valley Ironpigs from Reading Fightin Phils. SS Raul Rivas assigned to Reading Fightin Phils. Clearwater Threshers placed CF Jesus Alastre on the 7-day injured list. RHP Victor Santos assigned to Lakewood BlueClaws from Williamsport Crosscutters. RHP Francisco Morales assigned to Lakewood BlueClaws from Williamsport Crosscutters. LF Ben Pelletier assigned to Lakewood BlueClaws from Williamsport Crosscutters. LHP Jhordany Mezquita assigned to Williamsport Crosscutters from Lakewood BlueClaws. RHP Tyler McKay assigned to Williamsport Crosscutters from Lakewood BlueClaws. RHP Dominic Pipkin assigned to Williamsport Crosscutters from Lakewood BlueClaws. Philadelphia Phillies recalled RHP Drew Anderson from Lehigh Valley Ironpigs. RHP Tyler McKay assigned to Lakewood BlueClaws from Williamsport Crosscutters. LHP Ethan Lindow assigned to Williamsport Crosscutters from Lakewood BlueClaws. Philadelphia Phillies optioned RHP Drew Anderson to Lehigh Valley Ironpigs. Philadelphia Phillies recalled RHP Jerad Eickhoff from Lehigh Valley Ironpigs. RHP JD Hammer assigned to Lehigh Valley Ironpigs from Reading Fightin Phils. RHP Alexis Rivero assigned to Reading Fightin Phils from Williamsport Crosscutters. RHP Spencer Howard assigned to Clearwater Threshers from Williamsport Crosscutters. LHP Jhordany Mezquita assigned to Lakewood BlueClaws from Williamsport Crosscutters. RHP Dominic Pipkin assigned to Lakewood BlueClaws from Williamsport Crosscutters. RHP Tyler Carr assigned to Williamsport Crosscutters from Lakewood Blueclaws. RHP Jack Perkins assigned to Williamsport Crosscutters from Lakewood Blueclaws. Philadelphia Phillies optioned RHP Nick Pivetta to Lehigh Valley Ironpigs. Philadelphia Phillies selected the contract of 2B Phil Gosselin from Lehigh Valley IronPigs. Lehigh Valley IronPigs activated 3B Gift Ngoepe from the 7-day injured list. Lehigh Valley IronPigs activated RHP Tyler Viza from the 7-day injured list. RHP JD Hammer assigned to Reading Fighting Phils from Lehigh Valley Ironpigs. RHP Seth McGarry assigned to Clearwater Threshers from Williamsport Crosscutters. RHP Luis Carrasco assigned Williamsport Crosscutters from Clearwater Threshers. Reading Fightin Phils placed LF Cornelius Randolph on the 7-day injured list. LHP Jeff Singer assigned to Reading Fightin Phils. Clearwater Threshers placed LHP Zach Warren on the 7-day injured list. 3B Dalton Guthrie assigned to Clearwater Threshers. LHP Kyle Young assigned to Clearwater Threshers from Williamsport Crosscutters. LHP Ethan Lindow assigned to Lakewood BlueClaws from Williamsport Crosscutters. RHP Tyler Carr assigned To Lakewood Blueclaws from Williamsport Crosscutters. RHP Alejandro Requena assigned to Williamsport Crosscutters from Clearwater Threshers. RHP Kevin Gowdy assigned to Williamsport Crosscutters from Lakewood BlueClaws. RHP James McArthur assigned to Williamsport Crosscutters from Lakewood BlueClaws. Philadelphia Phillies recalled 3B Mitch Walding from Lehigh Valley IronPigs. Philadelphia Phillies recalled LHP Austin Davis from Lehigh Valley IronPigs. Lehigh Valley IronPigs activated C Matt McBride from the 7-day injured list. RHP Ben Brown assigned to Lakewood BlueClaws from Williamsport Crosscutters. LF Jimmy Smith assigned to Williamsport Crosscutters from Lakewood BlueClaws. Philadelphia Phillies optioned LHP Austin Davis to Lehigh Valley IronPigs. Philadelphia Phillies recalled RHP Edubray Ramos from Lehigh Valley IronPigs. RHP Andrew Brown assigned to Williamsport Crosscutters from Clearwater Threshers. Williamsport Crosscutters released C Gregori Rivero. Lehigh Valley IronPigs activated LHP Tyler Gilbert from the 7-day injured list. RHP Luis Ramirez assigned to Clearwater Threshers from Williamsport Crosscutters. The infamous "turf toe" has struck in Allentown... Oh noes! Steve Potter is reporting on Facebook that infielder Jesus Azuaje has been sold to the Rockies. Yeah, bunches of moves there, and several involving Clearwater (they "sent down" Spencer Howard after his outing yesterday). Mostly just paper games. 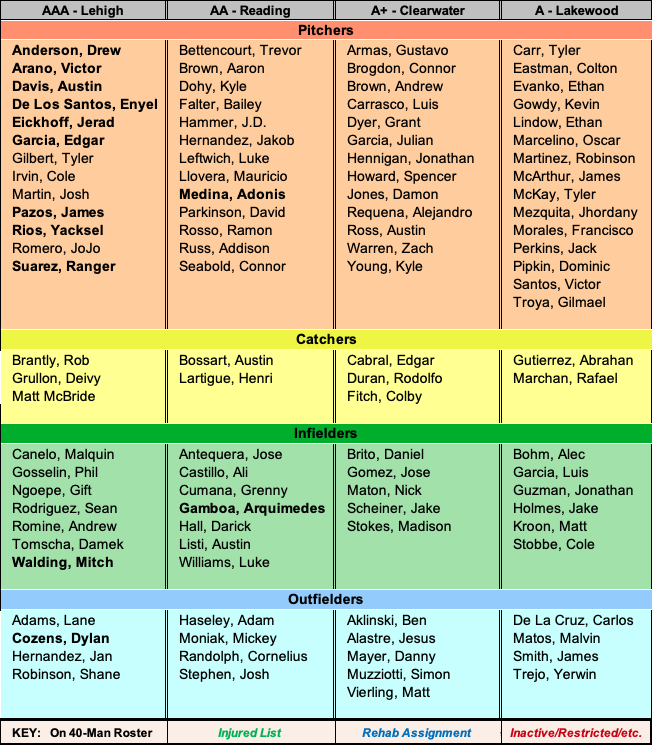 The Arano recall is real; the swap of SS Rivas for RHP Rivero between Reading and Clearwater is real, the Pelletier assignment is real - the rest are paper moves to get people temporarily off active rosters. Update: Alexis Rivero appears to have been promoted to LHV, not demoted to Clearwater. milb.com is now kind of reporting both - they have him on both the LHV and Threshers rosters. Steve Potter is reporting the move as to LHV (info from Housenick), so that's likely the real move. Fun and games. No Carlos De La Cruz demotion, which was kind of what I was expecting when Pelletier was ready.